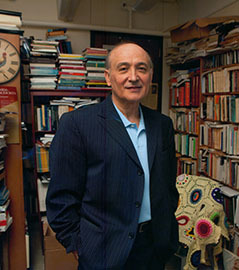 Professor Francisco Cota Fagundes is a well-known scholar of contemporary Portuguese literature, including the literature of the Portuguese North American diaspora. He is starting his 39th year of teaching at the University of Massachusetts Amherst. During this time, he has taught numerous new courses and published over thirty books and many dozens of articles in a broad field of areas. Professor Fagundes came to the University of Massachusetts Amherst in 1976. At that time, his teaching duties included the Spanish language and Peninsular literature. As the Portuguese program grew, particularly its graduate component, he confined himself to Portuguese-language studies. Among the many courses he has taught for the first time are Lusophone African Literature, the Short Story in the Portuguese-Speaking World, Visions of America in Portuguese-Language Travel Literature, Portuguese Literature in Translation, and Portuguese and Brazilian Modernism(s). Trinta e Muitos Anos de Devoção: estudos sobre Jorge de Sena em Honra de Mécia de Sena. Edited with former student António M.A. Igrejas and current student Susana Antunes. Daniel de Sá: Escritor dos Açores e do Mundo. Edited with former student António M.A. Igrejas and current student Susana Antunes. Uma Viagem pela Escuridão: Eu não nasci para ser feliz. An illness narrative, being translated into Portuguese.